Have you ever noticed how March is always windy? Well, I haven’t noticed it yet this year but March is still early and I know it’s coming. Those winds are a sure sign to me that spring is on its way. Besides the longer days, another sure sign for me is that the birds sing early in the morning. This means it’s time for me to migrate from doing desk-work to preparing to work outside in the farm. Seeds have already begun to arrive. Tomatoes and pepper plants have been ordered from the greenhouse for planting in May. In early April we will begin to take the straw off of the strawberries so they can soak up the sun from our longer days. Then April comes in with a bang…. 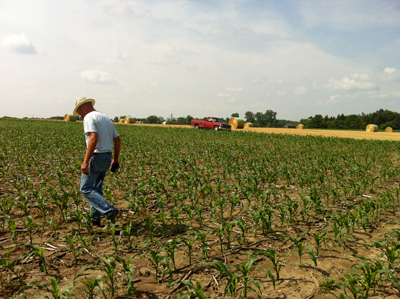 the fields are dry and ready for the first corn planting. Then it’s time to get the berries planted and the peas and…. the 2013 growing season is on! Do you like to plant and watch things grow? Do you enjoy seeing the first sign of young beans in your carefully tended plot? Or even better picking that perfectly red and ripe tomato and eating it right there in the garden? I know I do. If you garden, I hope you have a wonderful planting season. If you have never gardened, why not give it a try this season? And remember, if you want to know your food, the best food is the food you grow yourself. You can visit a sugar bush and maple syrup making demonstration at Bruce’s Mill Conservation Area on Stouffville Road near Warden Ave. until April 7. LeaAnn Voisin of Voisin Maple Syrup shares her family’s favourite recipe for using maple syrup in bread pudding. • Sugar for sprinkling (LeaAnne uses maple sugar). • Preheat oven to 350 degrees. Grease a 9”x 9” pan. Cut up bread into bite-size pieces. Put into a large mixing bowl and set aside. Mix up the other ingredients and pour over the bread pieces stirring until the bread is soaked. Pour into the prepared pan and let it sit for 15 minutes to allow the bread to absorb the liquid. Sprinkle with sugar. Bake uncovered for 50 min to 1 hr until the pudding is firm and crisping but still has a bit of a jiggle. When serving top with whipped cream or drizzle with additional maple syrup. 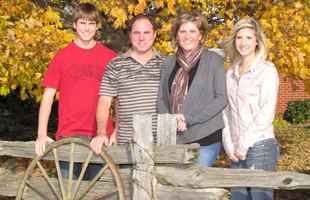 For over 20 years Reesor Farm Market and now Reesor’s Market & Bakery has been providing our customers with maple syrup made by the Voisin family in their sugar bush in Formosa, Ontario in Bruce County, about an hour away from Lake Huron. Current syrup-maker David Voisin’s great-grandfather George Voisin started the family syrup-making tradition by putting out 50 taps on his maple trees and boiling the syrup in an old fashioned sugar kettle. They currently have a total of 9000 taps and pipes to gather the sap from the maples. Brothers-in-law and nephews and nieces work in the sugar bush during maple syrup season, tapping the trees, checking lines and trucking in sap from holding tanks. LeaAnne and David’s teen-aged son and daughter help out in the retail storefront and with the boiling down of the maple syrup in the sugar kitchen. The evaporating room attracts neighbours, family and friends this time of year who enjoy coming out to see the maple syrup being made and enjoy a sample of warm maple syrup. Over the decades the family expanded and modernized their syrup production by tapping more trees and adding efficiencies to the process. Voisin’s Maple Products was formed in 1989 and David and LeaAnne built a new “sugar shack” housing a 5’×12’ evaporator for the processing of maple sap and a small sugar kitchen allowing for the production of maple sugar candy and maple butter. By the year 2000 they had outgrown that sugar shack and a large, modern facility was built along with a much larger kitchen area and packing room accommodating a wide range of gourmet maple delicacies now produced by the Voisins. We are pleased to carry Voisin’s maple products knowing that they take great pride to produce high quality maple syrup and maple products. We carry a complete line of Voisin’s Maple Products from sugar to syrup to maple butter in bottles, cans and in a variety of sizes. Good News! Our new store Reesor’s will open on Thursday, March 14, 2013 at 9:00 a.m. Our former Ringwood Dr. facilities will supply our new location with the baking and cooking goods you’ve come to know. Our larger, brand new store is located at 5758 Main Street in Stouffville, next to Barthau Jewellers). Look for our green-lettered sign! Our customers tell us they love to be greeted by the good smells of our kitchen and our friendly staff. At our new location you’ll still smell the familiar aromas of molasses crinkles cookies and pies being baked in our ovens in the store. Salome, our manager, along with the rest of our team, will be there to greet you and show you around. 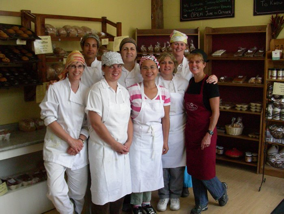 You’ll also see Sandra and Joyce and more of our kitchen staff when they come to lend a hand baking at the new location or for special events and cooking demonstrations. 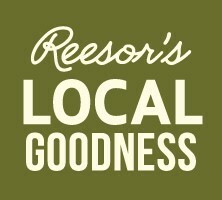 At Reesor’s our priority is to support and sell local food. We’re excited to have more room at our new location to provide you with a select range of fresh vegetables and fruits from Ontario as well a selection of out-of-season produce from other regions. When shopping at Reesor Farm Market, you know that food is coming from group of farmers providing you with Ontario fruits and vegetables in addition to what is grown at our farm on the Ninth Line. Some of those same farmers and some new ones will now be providing you with your daily produce needs at Reesor’s Market & Bakery. One new area at Reesor’s will be a selection of Ontario cut flowers. A new addition to our food selection will be gourmet cold cuts. These high quality meats have been sourced by Shirley who has many years of experience and expertise in the deli business and knows where to get the very best cold cuts in Ontario. You may have noticed that the dairy case has already started to expand at Reesor Farm Kitchen. Our new store will have an even wider choice of Ontario, Quebec, and other cheeses for you to taste. Be sure to try the new Pinehedge Farm yogourt and sour cream—they are delicious.